Event Description : FILM FEST : Stan Lee Film Festival. 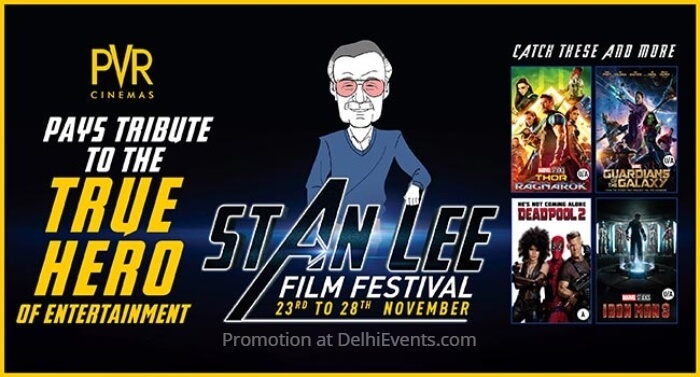 To honor the legendary Stan Lee’s legacy, PVR Cinemas pays tribute to the Marvel Legend at Stan Lee Festival. The 6-day festival will showcase a medley of superhero movies curated by Stan Lee where he gave wings to the comic characters and brought them to life. Priced at just INR 118 for a movie, the festival promises one last chance for all movie aficionados to binge-watch Stan Lee’s cinematic treasures like Avengers: Infinity War, Ironman, Deadpool and Guardians of galaxy.